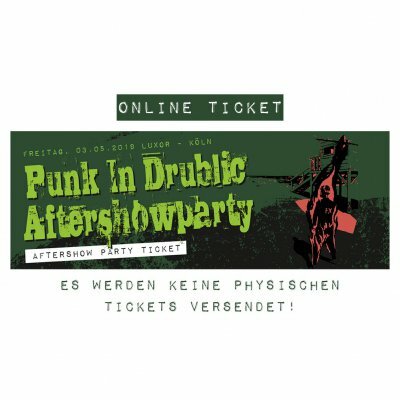 The ticket is ONLY valid for the aftershow party, which will take place independently from the festival Punk in Drublic 2019. Tickets to the show must be purchased separately. IMPORTANT: We will NOT send out the tickets by post. Please print out the order confirmation and bring your ID for personal identification. If you want to order more than one ticket and bring your friends, it’s enough if you can identify yourself. If you want to gift it to another person, please send an email (krmeusupport[at]kingsroadmerch.eu) and include the name of the presentee. Customer’s data (in this case shipping address) and person attending have to match. Tickets are excluded from exchange and return. Please make sure, that we received the payment till April 26th, 2019. Unpaid orders will be cancelled afterwards. As a Thank You for purchasing the ticket in our store, you will receive a 10% off coupon for your next purchase in our store. You will receive the discount code by e-mail at the latest on Mai 3rd, 2019.